How to add a new room type on HotelRunner? Please click the My Property / Calendar section from the upper menu of HotelRunner panel. In the room types section, please first add new rooms types from the Add New Room Type button on the right corner. From the pop-up window, select the Room type, Room number, Room capacity, the number of Adult Guests, Sales period, Pricing type (By Room/Person), Non-Refund rule and the Non-refund Confirmation (if applicable) and Price details and then click Create. 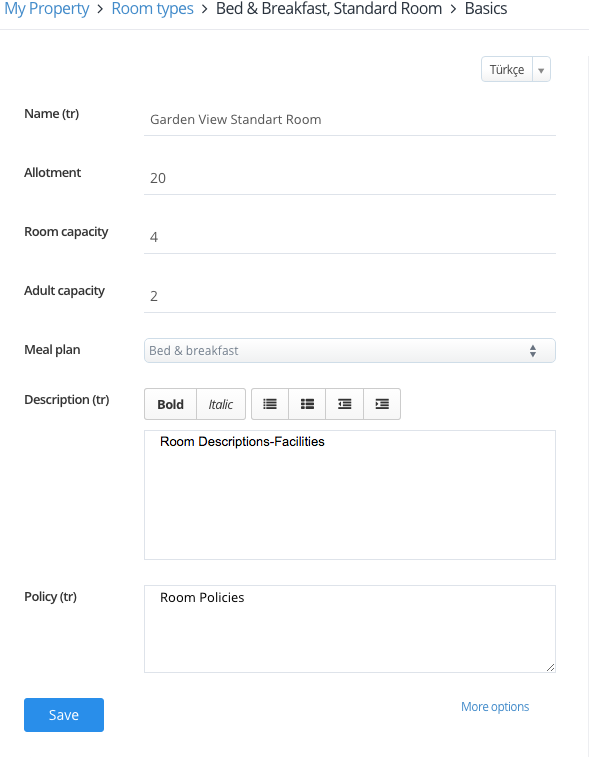 After saving the details, please enter further information about the room type you have added, and then click Save. Number of rooms: What is the total number of this room type in the property? Room Capacity: What is the number of guests who can stay in each x room? Adult Capacity: What is the number of adult guests who can stay in each x room?